AirTV today introduced its first dual-tuner capability to AirTV Player, allowing users to watch and record two over-the-air (OTA) broadcast channels simultaneously. With the new dual-tuner adapter, AirTV Player users can watch one OTA channel while recording another, or record two OTA channels simultaneously through AirTV Player's Local Channels DVR. Available today, customers can purchase the new dual-tuner adapter for $29 or bundle the dual-tuner adapter with the AirTV Player for $119. AirTV L.L.C. today introduced its "Local Channels DVR" feature to AirTV customers, allowing users to watch live and recorded local channels in- and out-of-the-home, no monthly subscription required. 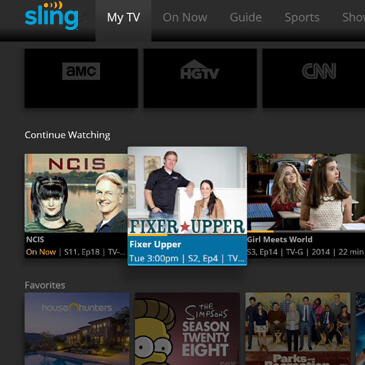 Recorded over-the-air (OTA) content is available in the Sling app alongside other Cloud DVR recordings. AirTV has launched a new solution that brings together the value of free local broadcast television with the power of live internet streaming. The new AirTV solution, when connected to an OTA antenna and a home Wi-Fi network, wirelessly streams free local channels to internet-connected TVs and mobile devices, in and out of the home. AirTV today began rolling out a free open beta test of its new "Local Channels DVR" for AirTV Player customers. The Local Channels DVR requires an external storage device to record free over-the-air (OTA) channels (like ABC, CBS, NBC and FOX) received via an OTA antenna and AirTV Adapter. A little-known secret for NFL fans: you can watch every local team game for free, including games usually on cable! All it takes is a digital over-the-air antenna. No bar tab or cable subscription required. AirTV, a brand dedicated to meeting the growing consumer demand for over-the-air (OTA) products and services, is now installing OTA antennas for consumers in all Lower 48 states through AirTV Pro Install. The service initially launched in 48 markets at the beginning of January. AirTV, a brand dedicated to meeting the growing consumer demand for over-the-air products and services, today began offering AirTV Player, a new 4K Android TV-based streaming device, and AirTV Pro Install, a service that offers expertise, installation and setup of OTA antennas. 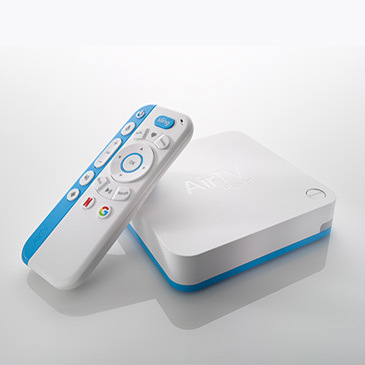 The AirTV Player in an Android-powered box that combines the ability to stream online video services -- including Netflix, Sling and other apps available in the Google Play Store -- and access live over-the-air TV channels, too. Between streaming services and local over-the-air (OTA) content, there's plenty of stuff to watch, even if you don't feel like dishing out the money for a cable or satellite subscription. The problem is accessing everything from the same source, especially if you've got a 4K TV. The Dish AirTV player aims to solve that problem by offering both streaming channels (including 4K fare) and OTA compatibility. There are a bunch streaming boxes available for cord cutters, but the new AirTV box from Dish has a very cool twist: integration with local, over-the-air (OTA) antenna channels. It also streams in 4K. AirTV's local TV integration gives it a leg up on similar streamers like the Roku Ultra, which provides 4K video for the same price point but has no way to include local broadcast channels in its interface. That means you can watch local broadcast programming (ABC, NBC, CBS, Fox, etc.) live without paying for cable and without switching inputs on your TV. The programming just becomes integrated into the listing guide on the AirTV, there to click over to when you browse.